Deep Lent is a time to join in the Lord's suffering and revere His Holy Face. It is time for our sacrifice. It is especially time for deep Adoration. In 2007, Our Lord and the Blessed Mother began to speak to the heart of a Benedictine monk at a monastery in Meath Mullingar, Ireland, a priest who at the time was greatly in need of their intervention. And so intervention, during Adoration, came. "Look to My Eucharistic Face and I will strengthen you in all your sufferings," the Lord told him as he prayed before the Blessed Sacrament. "You will suffer not as one defeated by the forces of evil, but as one already united to Me in triumph of My Resurrection. "My Heart will beat in yours and yours in Mine." Quite a promise for those who visit the Blessed Sacrament -- consoling Him, communicating with God in highest Heaven: that He will communicate back. This is Lent! And it was during this time of year, on March 1, 2010, that the Lord explained the value of trials to the Irish monk. We had two previous reports on this. "Suffering, for you," the Lord said, "is the humble acceptance of every limitation, fatigue, humiliation, disappointment, and sorrow. It is adhesion to all the manifestations of My Will, especially those that you are incapable of understanding in the present moment. "Suffering offered in love is precious in My sight. Accept sufferings that I allow and that I will for you; thus will you participate in My Passion through patience and accomplish the mission I have entrusted to you." Only with the clarity of God in prayer, of sacrifice, of Adoration, do we sense what the mission is and head for it. "I am about to carry out the plan for the renewal of My priesthood that for so long I have held in My Heart," the Lord allegedly told him. 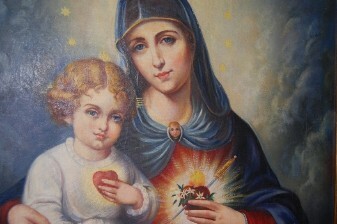 "They will assemble around My Immaculate Mother, who will instruct them and, by her powerful intercession, obtain for them all the charisms necessary to prepare the world -- this sleeping world -- for My return in glory. 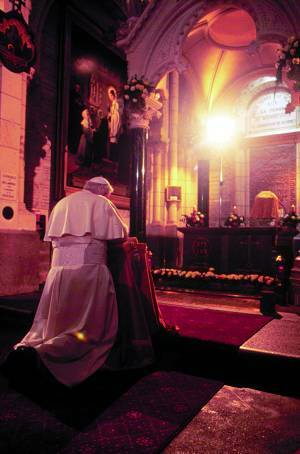 "The renewal of My priests will be the beginning of the renewal of My Church, but it must begin as it did at Pentecost, with an outpouring of the Holy Spirit on the men whom I have chosen to be My other selves in the world, to make present My Sacrifice and to apply My Blood to the souls of poor sinners in need of forgiveness and healing." Oh, but if our bishops would spread these words! Oh, but if our Church would tap into the deep charisms available to it. The priest, in that Irish monastery, was "prompted" to write down what he heard -- words of knowledge and insight and encouragement meant not only for him but, it seems, for us all. The priest's collection of his locutions is in his book, In Sinu Jesu: The Journal of a Priest At Prayer, which received an imprimatur from Bishop Michael Smith of Meath Mullingar, along with a Nihil Obstat. Do your priest a favor and give this to him. Might a Church in desperate need -- the Church in North America, as well as Western Europe -- not accept such writings as a guidepost out of the current crisis? "You console My Eucharistic Heart by giving Me signs of your friendship," the Lord presumably said, in locution, in whispers, in thoughts beyond normal thought. 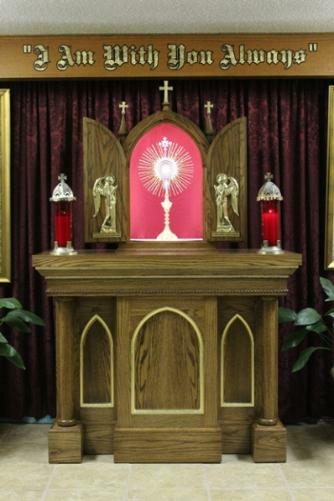 "Of all these, the one that most consoles Me is your presence before My Eucharistic Face. "What I ask of you, My beloved, and what I am asking of all my priests, is not difficult, nor is it impossible for the weak, the sick, and those who are homebound. "If you cannot come before My Eucharistic Face, you can be transported there spiritually by an act of desire coming from the depths of the soul. Ask Me to transport you before those tabernacles of the world where I am most forgotten, neglected, and even despised. "I will transport your souls into My Presence and receive from your adoration and from your love the consolation that I await from My friends." "Adoration will be for them and for you the restoration of the only right order: the order of Divine Love poured into the hearts of men by the Holy Spirit Who is Love. "My Heart will beat in yours..." Amen.